Get to know this small, active breed that is the national dog of Portugal. These cute dogs are intelligent and easy to train. The Pequeno was developed from the Grande version. The coat is either smooth (short) or wire; the wire coat is rough and long with more hair on the muzzle similar to a beard. Coat colors include yellow or fawn and may include white markings. Coats with black or brown coloring may also be seen. The thin, erect ears are pointed and triangular in shape. The head is wedge-shaped, and the tail is sickle-shaped. Height averages vary from 8 to 12 inches tall, and weight varies between 9 and 13 pounds. Average life expectancy is well into the teen years. Some reports state that this ancient breed dates to 1000 BC when the dogs were brought to the Iberian Peninsula by Phoenician traders of Asia Minor, although other sources date the breed to the eighth century. The dogs were further developed by the terrain and climate of Portugal, where they hunted rabbits. They were also used aboard ships to control vermin and as hunters on land at ports to provide meat for the crew. The wire coated version of the Pequeno was lost at one point. A successful recovery breeding effort was started in the 1980. The small and intelligent Pequeno was known for using its keen senses of sight, hearing and scent to hunt. Also notable is the breed’s incredible stamina; the dogs can hunt all day long and repeat the same duration the next day without delay or fatigue. The breed become popular in the United States in the 1990s and was added to the American Kennel Club’s Foundation Stock Service in 2004. The AKC later moved the breed to the Miscellaneous Class in 2011 and finally the Hound Group in 2013. The Pequeno is the 177th breed to be added to the AKC. Originally rabbit and vermin hunters, Pequenos are companion pets and may also participate in conformation, agility, rally, obedience and act as a watchdog. Pequenos are fast, active, intelligent dogs with high energy and stamina. They are efficient hunters and can hunt alone or in a pack. They are easy to train and need firm and consistent training and socialization. Because they have a high prey drive, they should be supervised around other animals. Outdoor activities require the dog be on a leash or within an enclosed area because of the tendency to chase after prey. The strong prey drive leads to their need for mental stimulation and to expel energy. This active breed needs long, daily walks or jogs and, as mentioned, should be leashed when outdoors. Pequenos are fast, so if they decide to chase an animal, catching them might be difficult. They are not recommended for apartment living unless you can make a strong commitment to exercise. The breed does well in warm climates. Pequenos are average shedders and do not need extensive grooming. Brushing once per day is sufficient to remove dead hair or debris picked up outdoors. As with any breed, be sure to clean the ears, pay attention to dental hygiene and keep the nails at a comfortable length by regular trimming. This breed is considered extremely healthy and has no known genetic defects or diseases. Is the Portuguese Podengo Pequeno the Right Dog for You? 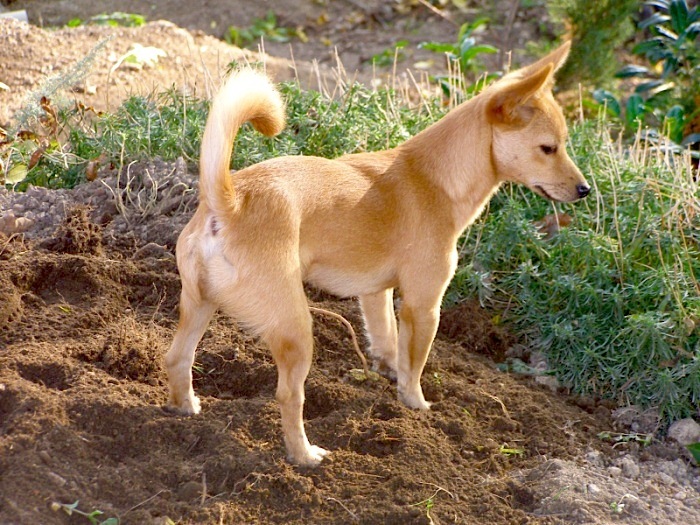 Pequenos are active, small dogs originally bred to hunt rabbits and vermin. They are high energy pets with a strong prey drive, so homes with smaller pets are not recommended for this breed without continuous supervision. The most important quality in terms of compatibility centers on exercise. The dogs need long walks or jogs every day to expel energy. They also need to be in enclosed areas or on a leash to prevent them from taking off after an animal they see as prey. Grooming and health problems are extremely minimal for this breed, so time and cost are lower than with most breeds. If you can commit to the exercise needs, a Pequeno might be an excellent choice for your next dog. Purebred dogs end up in shelters and rescues every day. Check those resources first, and you can start with our adoptable dog search. Pequenos are not as populated in the United States, so finding one may be difficult. If you go through a breeder, contact the parent club for recommendations and beware of puppy mill warning signs before visiting.